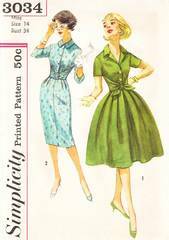 Vintage Simplicity pattern for Misses' dress with shaped half belt sewn into side seams and tied or buckled in front. Full, softly pleated skirt or slim skirt with back kick pleat. Front buttoned bodice and convertible collar. Pattern is complete; partially cut. Envelope and contents are in very good condition.